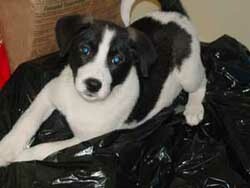 Norm is one of a litter of five Aussie mix pups who came to us from a high volume shelter in KY. He loves to play and explore. He loves the snow and is just a joy to watch. He's already neutered and microchipped. 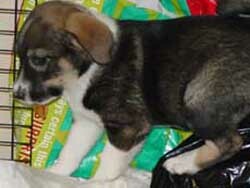 Diane is an adorable 12 week old pup who came from a litter of Aussies, but she looks beagle and is really small. She weighs about 12 pounds and is just as petite and girly as they come. She doesn't have the beagle bark but she sure has the playfulness. She is curious about everything and everything becomes a toy, but people are her first priority. She loves to be held, but is not demanding for attention. We think she's just the perfect pup and hope to get her a great home. We will be showing her by private appointment this week. Cassy is a 7+ year old spayed female yellow lab who recently lost her home when her elderly owners had to go into assisted living. She was well loved and cared for her entire live and she loves everybody she meets. She was raised as an only dog but loves dogs and cats. She is also good with kids. She has recently lost a good amount of weight and needs to lose a bit more and tone up with exercise. We want to make sure whoever adopts her will walk her daily so she can tone up. She will turn 8 on March 2nd and she takes thyroid medication. 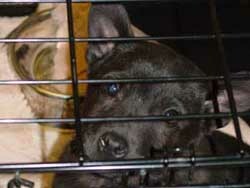 Elvis is a ten week old Shepherd mix pup who came in with the litter of lab mixes. He is the quieter of the litter so may need a quieter home so as not to traumatize him. He's adorable and playful once he feels comfortable in his environment. This cutie is Greg! 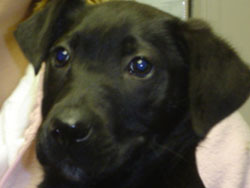 He is about 3 1/2 months old (as of 1/6) and is a Black Labrador Retriever mix. He was brought to us by his person. That person found him as a stray and kept him a couple weeks hoping to locate his owner. That didn't happen, so they sadly brought him to us. They were quite taken with him, but realized they did not have the time to properly care for him. He is super cute and has a great personality. He is really sweet and adores being with people. He loves attention and is happy to give you lots of love. He is a real people pleaser! He is active and playful. He should grow to be the size of a typical Lab. 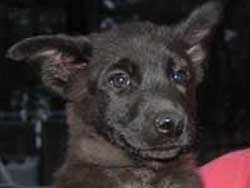 This puppy is sure to charm and amuse you. He will be available after 1/31/06. 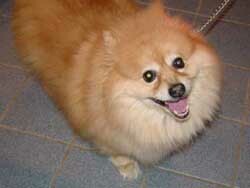 Palmer is a five year old neutered male Pom who became displaced when his 90 year old owner passed away. He needs to lose a few pounds as he was fed table food, but he is a very happy boy as you can see from the pictures. He is quiet in his crate and is the perfect little boy according to his foster home. He loves other dogs and plays nicely with them. 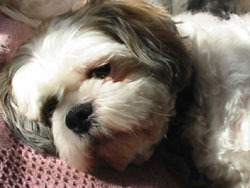 Baker is a 4 yr. old purebred shih tzu who is very very sweet -- and people oriented. His favorite thing to do is to spend time with his human. He loves attention and to be petted & brushed -- and there's nothing better than a great tummy rub! 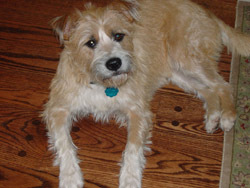 He's very personable, wags his tail often and loves to go outside. 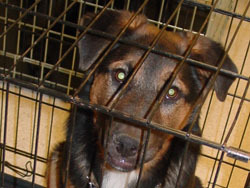 Baker had to leave his home where he was very much loved, but due to a divorce and other difficult circumstances, his owner could not keep him. Baker has always been a "dominant male" in his household would not do well with other dominant and/or larger dogs. He will need a little reinforcement training, as he sometimes will mark inside. This is very well controlled by using a leash inside and/or band, just time and consistency, with positive reinforcement, is all the he needs to help him improve his manners. If you have room in your home and your heart for Baker, you will receive more love than you can imagine. He is a absolute sweetheart and will give back love 10 fold! We want to find a wonderful home for him so that he will never have to be uprooted again. 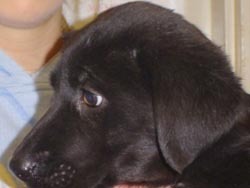 Brian is one of a litter of five shepherd/lab pups who came to us from a high volume shelter in KY. He is the largest male of the litter. He's crate trained. Please do not call us as we don't have the resources to return calls. Buster is a three month old lab mix puppy. He's supposed to be beagle/bassett, but doesn't look like either. He will be available after 1/31/06. 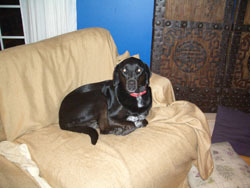 Guinness is a black lab, pointer mix. She is 3 1/2 and spayed. She loves to snuggle. Her most favorite thing in the whole world is a good tushie rub (a good scratch on her behind). When you rub her tush she wiggles in glee. 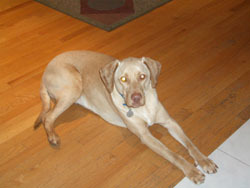 Although she is more timid Izzy and Kozmo, she is great with the kids and other dogs. She is just a little more cautious with strangers. Dixie is a two year old female terrier who was rescued by her family a year ago and they have worked with her, but feel she needs a different situation. When she first arrived, she was terrified of everything and very shy. As she grew comfortable in her environment, she became too protective of the household. She is fine with the other dog in the family and is tolerant of their ten year old daughter, but too nervous to have children running in and out of the house. She needs socialization in a controlled, child-free atmosphere. She would do well with an experienced terrier owner. 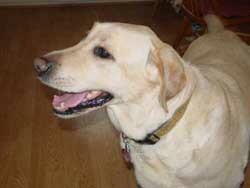 She has demonstrated that she will bond well with her family and can live with other dogs. She is the dominant one of her current dog pack and is protective of her smaller terrier brother when other dogs approach. 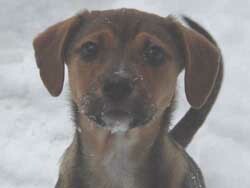 She would probably do well as a one-person dog, but will need to be socialized unless you want a good watch dog. We would rather see her get the socialization she needs. She is a young dog with a lot of potential and just needs to go to the right adopter. She is with her current owner and will be available to be seen by private appointment after your application has been reviewed and accepted. Izzy is a female 4 year old pointer lab mix. She is spayed. She is very sweet and gets along well with other dogs (she lives with two now). She has lived her whole life with small children. When her owner had an operation, she sat with her during my entire recovery and would not leave her side. 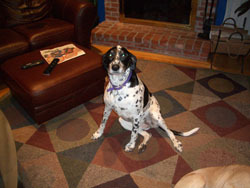 She is the "top" dog in her current home and she has a calm confidence about her that is regale. Kozmo is a 3 year old male neutered male. He is a yellow lab. He is everybody's favorite. He get along well with other dogs and young children. His is very licky. He will smother you with kisses at every opportunity. He sits still while all my children play, jump and roll around with him. He thinks he is one of the kids. He is very snuggly and loves to hang out on the couch with you. He also loves that park and will swim across the lake. He is a great swimmer. Lilith is one of a litter of five Aussie mix pups who came to us from a high volume shelter in KY. She is a sweet pup, goes into her crate willingly and loves to play and explore. She is a happy pup, full of antics and just a joy to watch. Please do not call us as we don't have the resources to return calls. 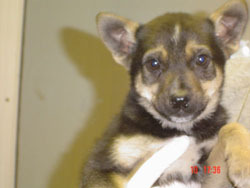 Nancy is the one female in a litter of male pups who who came to us from a high volume shelter in KY. She is a sweet pup. Crate trained, quiet in her crate. Too small to stay alone during the day. Please do not call us as we don't have the resources to return calls. 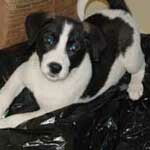 Norm is one of a litter of five Aussie mix pups who came to us from a high volume shelter in KY. He is a loves to play and explore. He loves the snow and is just a joy to watch. He's already neutered and microchipped. Please do not call us as we don't have the resources to return calls. Ranger is a very playful and affectionate five-six month old puppy. He looks about 90% Shepherd with a touch of something else, either collie or lab, but he could be a purebred as well. He is all fun and games and loves to crouch and pounce on leaves and toys. He is quiet in his crate and has no accidents. He seems really good about not jumping up as well. He loves to just run and run in the back yard, in big circles. He is just a big mush. 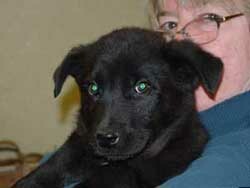 Scott is one of a litter of five shepherd/lab pups who came to us from a high volume shelter in KY. He is a sweet pup. Please do not call us as we don't have the resources to return calls. 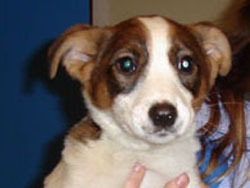 Woody is one of a litter of five Aussie mix pups who came to us from a high volume shelter in KY. He is a just adorable and loves to play and explore. He's the largest male and beautifully marked. He's already neutered and microchipped. Please do not call us as we don't have the resources to return calls.